We have recently released the Website Booking Plugin, and we are currently working on exciting updates to expand this great feature. We are excited to announce a new “Join a Class” option for companies offering open classes. If you haven’t enabled and configured this plugin yet, you can follow the steps in this article. You can then choose the relevant option under “Booking Modes”. Depending on your business’ service offerings, you can choose to allow students to book lessons online, join open classes, or both. If you have both options enabled, your clients will have the option to select the relevant option when clicking on your booking button. This add-on is required to start scheduling open classes in the calendar. When adding or editing a lesson, select the “Open Lesson” checkbox and set a number of available spaces for the lesson. You can display the button along the edge of your website visitor’s browser, or you can display a button inline. You can change the colour and text on the booking button, but if it still feels too limited, you can create a custom button and use the Booking Page URL provided. When prospective and existing clients visit your website, they will be able to click on your customized embedded button to view classes open to join. Lessons up to 3 weeks in the future will be displayed right away, but clients can click on “view more” to reveal more lessons (3 weeks at a time). There are a number of filtering options that will simplify the search process a bit. Clients can search for open classes by date, filter by teacher, or enter a search term. When they find the class that they want to join, they can click on the “Join” button on the right and fill in their details. They will then have the option to confirm their selection and will be presented with your selected completion message. The Lesson Bookings Table contains detailed information about lessons booked and joined through the Website Booking Plugin. This table can be found under “Calendar” -> “Lesson Bookings”. From this table you will be able to activate new profiles, merge profiles with existing profiles and view more information about the lesson. An “action” column is included to make it easy to see if the student booked a lesson or joined a class. 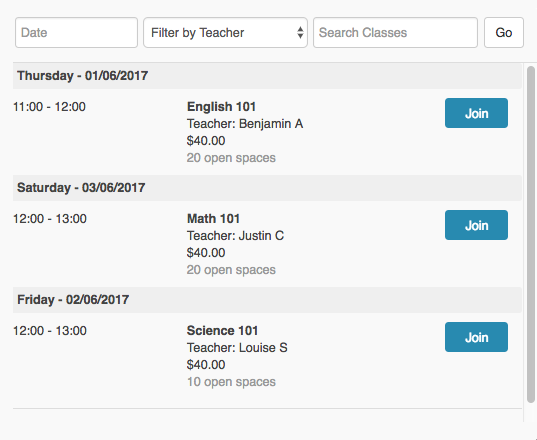 To make it even easier to see new booked or joined classes, you can add a widget to your dashboard. Generate more business and ensure repeat business by providing a simplified booking solution to your clients. 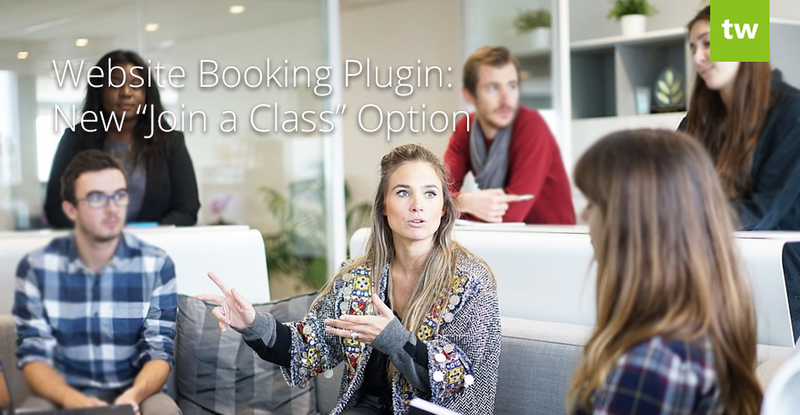 The Website Booking Plugin is easy to configure and even easier to manage.